»Uncategorized»Global Hotdish Supper Club: Italy! Global Hotdish Supper Club: Italy! One of the things I have missed most from Chicago are the nights that my friends and I would get together and cook a fun dinner together. 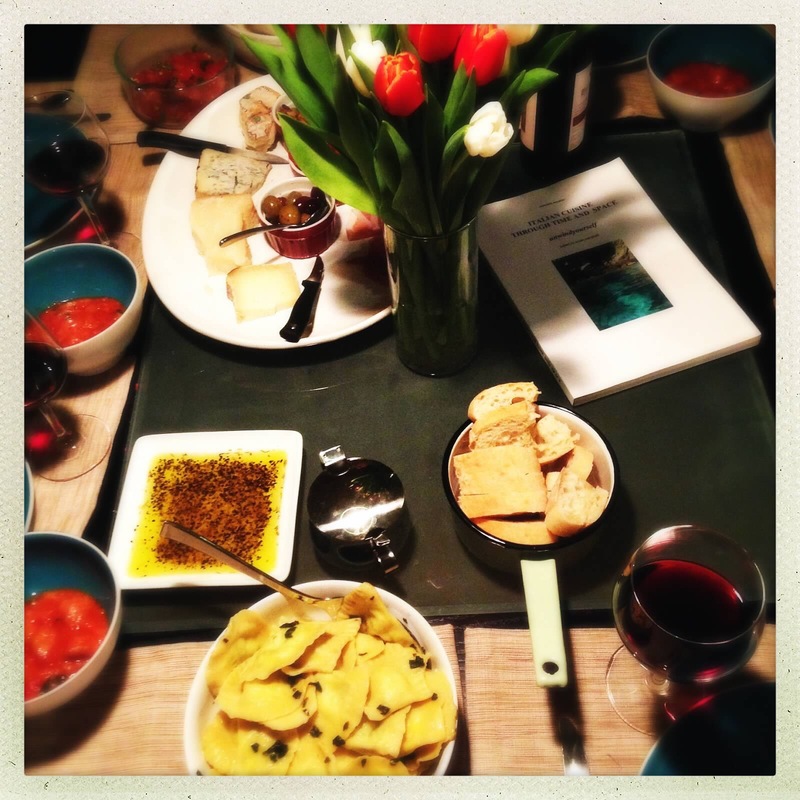 We would drink wine and snack on cheese while we took our time cooking some new dish (pasta made from scratch was a favorite), often not sitting down to eat the actual dinner until very late because we had so much fun through the cooking experience. Sometimes it was only two of us, sometimes it was a house-filled dinner party. The size of the group never mattered, it was that I got to spend time with my closest friends making memories doing one of the things I love most: cooking. I recently was sharing these memories with my sister-in-law Lindsay when she mentioned being a part of a Global Hotdish Supper Club and invited me to join. I was thrilled to be invited! The format generally works by the group deciding on a host, then voting on a cuisine. The host chooses the main dish to make and then everyone else fills in with appetizers, sides, desserts and drinks. The first time I joined, the group was breaking protocol a bit and simply meeting at an Ethiopian restaurant for dinner. I had never had Ethiopian food before – I recommend trying it! It was adventurous, hearty and delicious. At the Ethiopian restaurant, I shared our story of living in Italy for 3 months before moving back to Minnesota. Everyone immediately was interested in doing Italian cuisine for the next supper club. And since I was the one that had the cooking class experience from Italy, I volunteered to host! The next step was deciding what to make. First, I knew I wanted to make fresh pasta. Everyone loves fresh pasta and it had been far too long since I had made it anyway, so I was looking for an excuse. 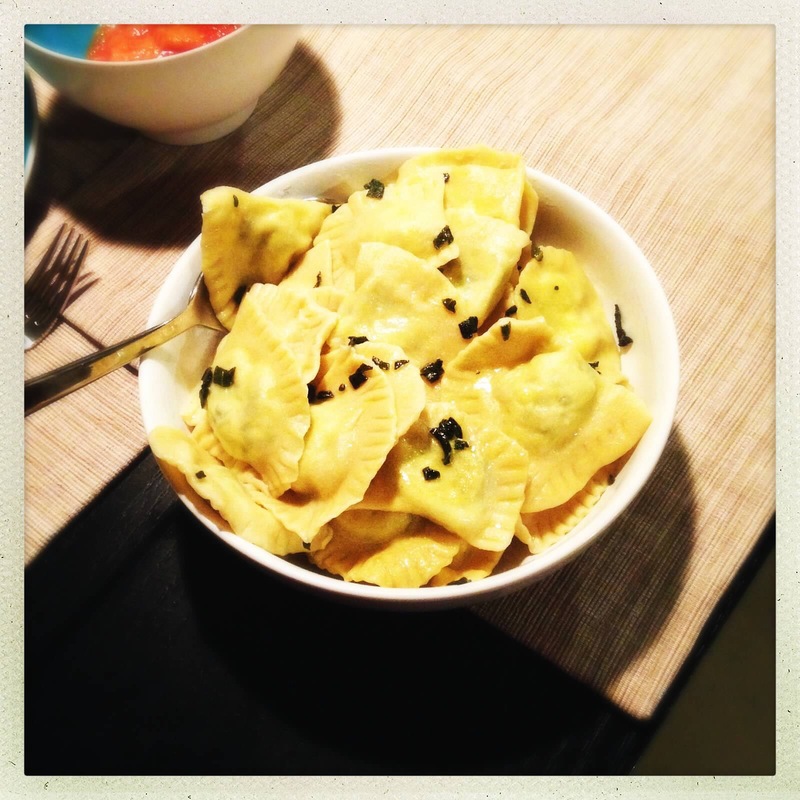 I decided to go with the classic spinach & ricotta ravioli in a sage butter sauce. The key to this dish is to splurge for really good ricotta and Parmigiano Reggiano cheese. The fresher the ricotta, the better. I am lucky that my local grocery store makes a fresh ricotta in-house. I also wanted to make a meat dish, but wanted something that could be prepared ahead and that was a bit more exotic than the ravioli. 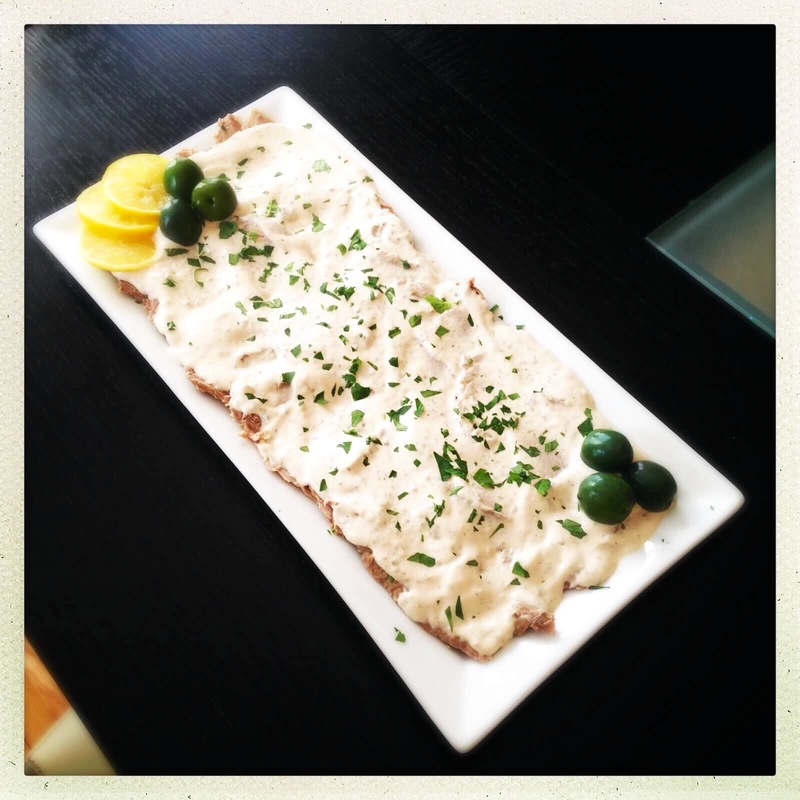 I decided to make a dish we had a couple times in Italy, Vitello Tonnato or Veal in Tuna Sauce. The dish sounds strange, I know! The first time we tried it we were being adventurous (see Florence: Day 53). Our first surprise was that the dish was served cold. The second surprise was that it was strangely addicting! So much so that we tried it again later in our trip (see Florence: Day 76). That evening there were 6 of us around a table filled with meats, cheeses, tomato and bread soup (my sister-in-law made the recipe from Florence: Day 27), bread and wine. Then we enjoyed panna cotta and homemade limoncello for dessert. There was a lot of great conversation and tons of laughter! I truly enjoyed the evening and am so thankful to have been included in such a special group of women who share my love of food and exploring different cuisines!